San Francisco's Bare Escentuals cites this mineral veil as their most popular product. Oprah (yes, that Oprah) has plugged it on her show. But--what does it actually do, if anything? What is a mineral veil? The term, as far as I can tell, was invented by Bare Escentuals to describe this product. It is a lightweight powder you put on after you've put on all the rest of your makeup, to keep it in place--a translucent "finishing touch," if you will. With the advent of high definition tv and film, makeup artists have been looking for products to keep makeup in place without showing up on the cameras. 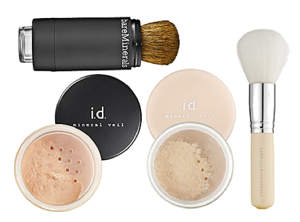 Bare Escentuals mineral veil is used by many makeup artists because it fulfills all of these functions. Having used this product, I can speak from experience and say that it does keep your makeup in place for hours, though not perhaps all day. It also keeps your makeup from running if you use blotting papers or start to sweat. Other reviewers report similar results. However, not every customer is as enthusiastic as Oprah. The product contains bismuth oxychloride (CI 77163), which can cause skin irritation, especially itching and burning. Bare Escentuals mineral veils come in various tints for different skin colors. They've also released "feather light" and "hydrating" formulas. You can buy mineral veil at Sephora, Nordstrom, Bloomingdale's and beauty.com. Join in and write your own makeup review! It's easy to do. How? Simply visit our Makeup Reviews page and fill out the form. We'll e-mail you when it's published.